Simon Says Make it Colourful! Hi all and welcome to another week on the Simon Says Stamp Challenge. Thank you for joining us for the Anything Goes Challenge and we hope you will all join us again this week too. This week the challenge is MAKE IT COLOURFUL! When somebody says, make it colourful, I am in heaven. I LOVE colours. So I decided to have fun with it. Although I going into Spring where I live, I wanted to use rich earthy colours. So I choose Autumn colours to play with. Also since I received this One with Nature stamp set and die from Simon Says Stamp, I haven’t had time to play with it. So this stamps set will be perfect for this challenge. Here is my take on the make it colourful challenge. I started with stamping and copic colouring the oval leaf image diagonally to make my background. I used autumn reds, greens, browns and yellows. Instantly the background looks rich and beautiful. I then trimmed the top of this panel at an angle. I also stamped the quote from the stamp set towards the bottom of the panel using brown ink. Then also brushed the leaves heavily with Wink of Stella shimmer pen. 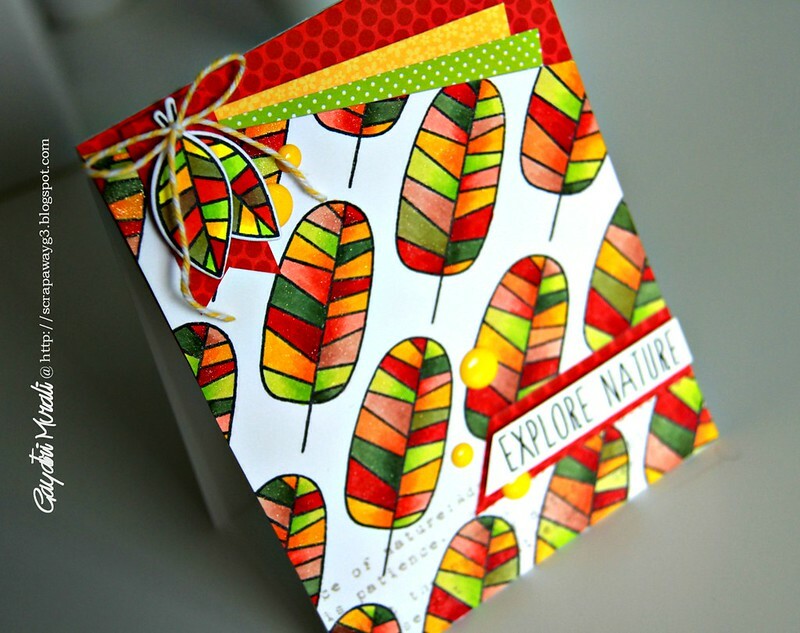 To complement the colours on the stamped images, I used Doodlebug’s Kraft in Color pattern papers. I added some pattern papers at an angle on the top of the card base. Then I adhered the stamped panel. 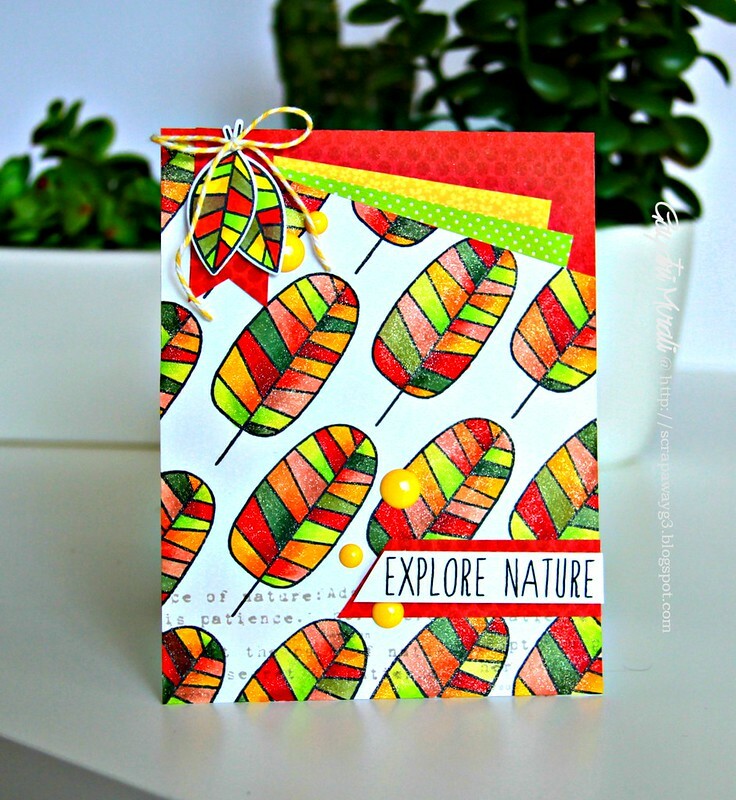 To balance, I added two coloured diecut leaves from the stamp set over a fish tail banner on the top left and layered stamped sentiment banner towards the bottom right. Finally I added some yellow enamel dots and a yellow bow using Doodlebug’s yellow backer’s twine to finish the card. I am pretty pleased with my card especially the rich colours. Hope you like it too. Wow! This is stunning! The colors are AMAZING! 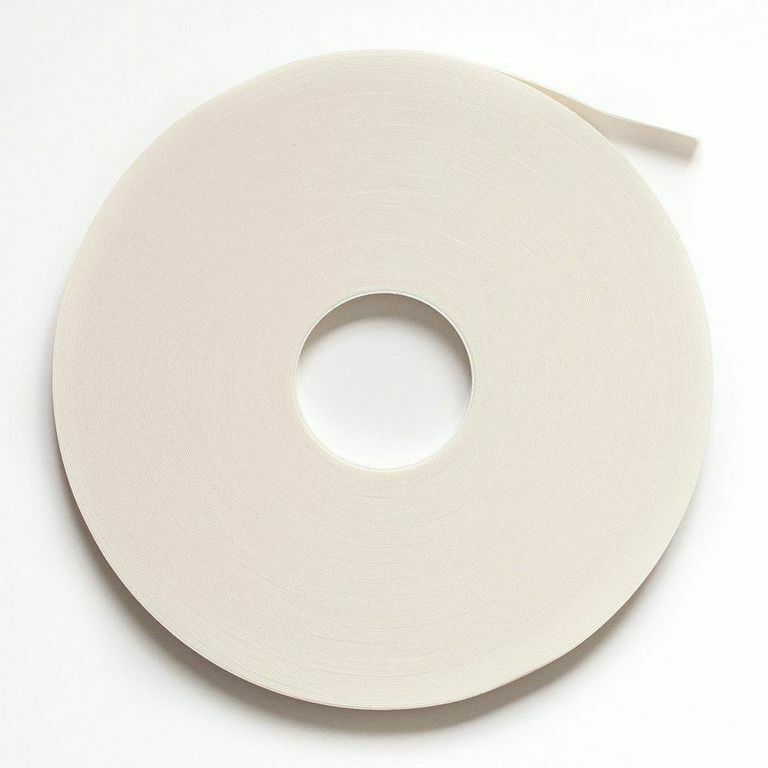 I love what you did with these leaves, Gayatri – you tipped this set into my cart! Wonderful colors for fall! 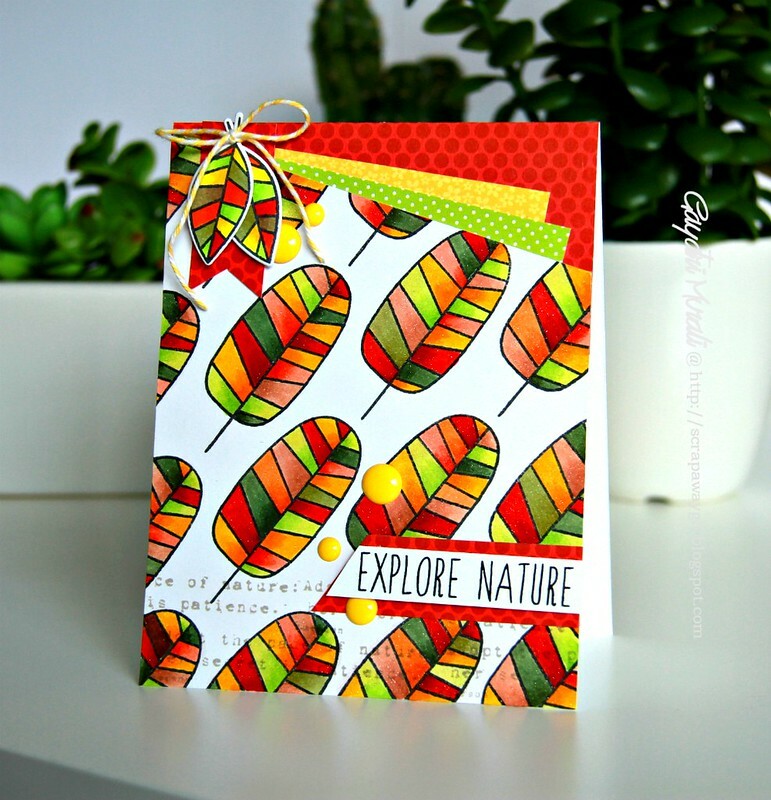 Hi Gayatri – a stunning card with a super design and I love the arrangement of there beautiful coloured sparkling leaves!! Oh, be still my heart. Can you say gorgeous? Well, I can and will shout it from the rooftops. Oh my gosh, so bright and beautiful. Great job Gayatri. WOW!! Amazing!! I just love the cheerful colors and images!! WOW you certainly fulfilled the challenge – colorful is not enough to say. You used normal fall colors but somehow they sing/scream autumn and are so pretty. Great job. Love the rich colors you used!! And I love this leaf print! Amazing card! Cutting on an angle really makes the card stand out. Thanks for sharing!!! STUNNING coloring and I love the touch of sparkle!! WOW!! That card… Oh goodness! It is STUNNING!